The smallest paver of Carlson's CP-line, the 17,000 lbs. CP75 II features a 74 horsepower Deutz® turbocharged diesel engine (No DEF) for superior performance and reliability. 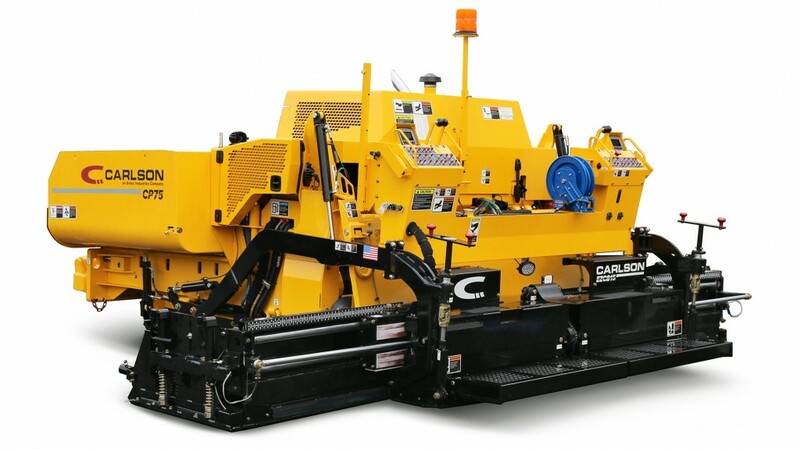 The smallest paver of Carlson's CP-line, the 17,000-pound CP75 II features a 74 horsepower Deutz turbocharged diesel engine (No DEF) for superior performance and reliability. The platform features the wide-conveyor class' only one-piece forward tilting hood, side doors and access panel in the hopper for leading access and simple service. For operators, the 2019 model enhances ergonomics and simplifies operation with the all-new control stations. Screed mounted to keep relative to the operator at all times, the platform's controls now feature electric switch controls, direct connect steering, and folding 4.5 inch LED display for up to the second information on performance and instrument gauges. The control groups are intuitively organized by function, providing full control of the platform at the fingertips of the operator. Already a leader in eliminating under hopper cleanout and achieving superior efficiency, the CP75 II will now be available with the option of two material conveyor systems. Contractors will be able to choose between a traditional wide conveyor chain and slat system, or the patented High Flow Material Conveyor hybrid belt system, depending on their applications and needs. With a fully redesigned frame, the CP75 II does not require hydraulically lifting hoppers and thereby eliminates the daily cleanout required on competitive machines. Efficient material management is further gained by the class-exclusive horizontal sliding damper doors, a design that keeps obstructions such as utility boxes from damaging them while open. Just like its highway-class screeds, renowned for their award-winning mat quality, Carlson has built in many of its industry-leading innovations and technology into the EZC815 commercial screed that is standard on the 2019 CP75 II. From its class-exclusive 2% screed taper, true spring loaded endgates, and a host of other features once reserved for highway-class screeds, the EZC815 achieves leading mat quality and performance in an 8'-15' package. In addition to the unveiling of the 2019 CP75 II, Carlson will also feature its full line of CP-line platforms with the CP85, CP100 II and CP130. Carlson will also feature some of its leading highway-class screed platforms available for all current North American tractors with the EZIV08 and EZR208, the Tacoma-based manufacturer's newest rear-mount platform. Just like its highway-class screeds, renowned for their award-winning mat quality, Carlson has built in many of its industry-leading innovations and technology into the EZC815 commercial screed that is standard on the 2019 CP75 II.